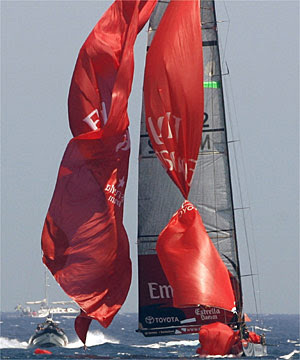 After all the excitement of winning the Louis Vuitton Cup, the kiwis are back obsessing about the real Cup to be won. Everyday there is plenty of analysis of the racing overnight as the lead story on the news. Seems that the last couple of days have not been good for Team NZ. Firstly, they waited for Allingi to make a mistake, opphs, then they didn’t and went onto win. Last night (yesterday in Valencia) seems that it was the kiwi’s making the mistakes. So it’s 2-3 down to the kiwis, not a good look!